Malta on Sunday rejected an Italian demand that it accept a ship carrying 629 migrants after Italy closed its ports to the vessel. 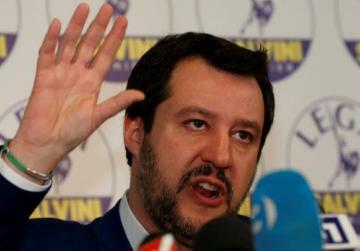 The unprecedented decision to bar the MV Aquarius from Italian harbours was taken by new Italian right-wing Interior Minister Matteo Salvini in line with an election pledge to take a tough line on migration. He demanded that Malta must accept the migrants instead. New Italian Prime Minister Giuseppe Conte later phoned Prime Minister Joseph Muscat about the issue. But Dr Muscat said Malta was refusing to allow the ship in because, in terms of international law, the migrants should have been taken to the nearest port to their rescue, which was not Malta. The government added in a statement issued later that without prejudice to its position, and in conformity with its policy throughout the past years, Malta was willing, where possible, to carry out emergency medical evacuations of persons requiring urgent medical care for humanitarian reasons. "In the meantime," it said, "the Maltese government is concerned at the Italian authorities’ directions being given to Aquarius on the high seas which go against international rules, and risk creating a dangerous situation for all those involved." The standoff is the second in three days between Italy and Malta over the fate of migrants rescued from the Mediterranean. The 629 migrants were embarked on the Gibraltar-registered ship Aquarius on Saturday-Sunday night in the Libyan rescue zone - an area closer to Libya. Tunisia and the Italian island of Lampedusa, than Malta. Most of the migrants were rescued hours earlier by the Italian Navy itself, as well as other ships, in operations coordinated by the Rome Rescue Coordination Centre. International laws lay down that rescued people have to be taken to the closest safe harbour. 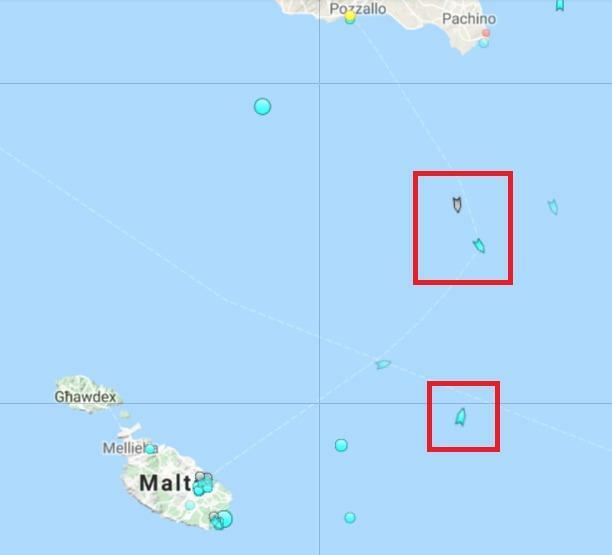 Over the weekend Italian media repeatedly claimed Malta had rejected 180 migrants rescued on Friday, but Malta insisted it was not the closest harbour for them. Matteo Salvini insisted on Friday that Malta could not continue to say no to migrants. But Prime Minister Joseph Muscat said on Sunday morning that Malta always respected and would continue to respect international law, a position reiterated by a government spokesman in the afternoon as the latest case developed. 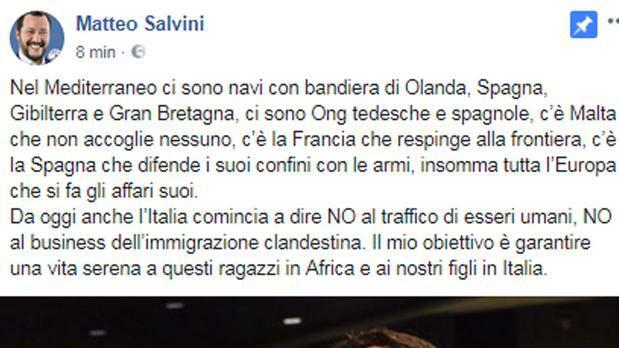 Italian media reported that on Sunday afternoon Salvini wrote to the Maltese authorities warning that Italy would no longer offer to receive migrants. "The rescue by NGO boat Aquarius was conducted in the Libyan Search and Rescue region and coordinated by Rescue Coordination Centre (RCC) Rome. RCC Malta in this case is neither the competent, nor the coordinating authority." Médecins Sans Frontières, the NGO which picked up the migrants, said, that after an extremely busy night in the central Mediterranean, the Aquarius had 629 people on board including 123 unaccompanied minors, 11 children seven pregnant women - from six different operations. A number of journalists are also on board the vessel. Some 400 of the migrants were rescued by Italian navy, Italian coastguard and merchant vessels and transferred to the vessel. One of the rescue operations was particularly tricky as a boat broke apart and some 40 people were thrown overboard and were then picked up from the dark waters. 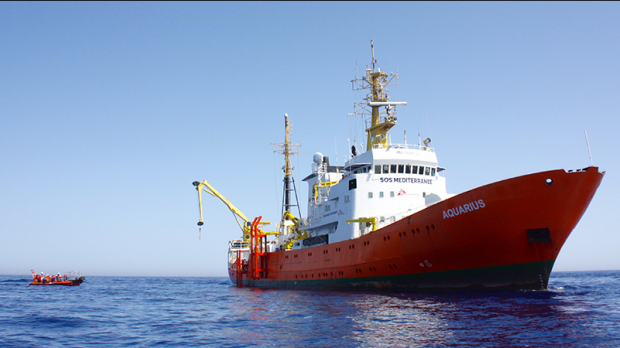 By Sunday evening, the Aquarius was 27 miles east north east of Malta, in international waters 'awaiting orders'. It was still in the same area on Monday morning. Project coordinator Aloys Vimard said there was enough food on board for two or three days, but he hoped the migrants could be transferred to a port of safety as soon as possible. The mayor of Naples and several other harbour towns in the south of Italy voiced disagreement with the Italian Interior Minister's decision and said they were prepared to let the migrants' ship in. Naples Mayor Leoluca Orlando in a Facebook post said he was ready to open Palermo’s seaport to allow the rescued migrants to safely disembark. Mayors in Messina and Reggio Calabria agreed with his view. Maltese NGO Integra said the priority at this time must be the safety and wellbeing of the individuals rescued at sea. "Politics must take second place. Regardless of the outcome of this incident, we remind the government of Malta of its international human rights obligations, and trust that all measures have been taken to ensure that the country is ready to receive refugees saved at sea in a humane and dignified way." The Aquarius (bottom box) and two Italian patrol vessels (above) in the early evening.